Blurb: Kate Mosse is back with a haunting ghost story from the French mountains. From the bestselling author of LABYRINTH and SEPULCHRE - a compelling story of ghosts and remembrance. Illustrated throughout by Brian Gallagher. The Great War took much more than lives. It robbed a generation of friends, lovers and futures. In Freddie Watson's case, it took his beloved brother and, at times, his peace of mind. In the winter of 1928, still seeking resolution, Freddie is travelling through the French Pyrenees. During a snowstorm, his car spins off the mountain road. He stumbles through woods, emerging in a tiny village. There he meets Fabrissa, a beautiful woman also mourning a lost generation. Over the course of one night, Fabrissa and Freddie share their stories. By the time dawn breaks, he will have stumbled across a tragic mystery that goes back through the centuries. 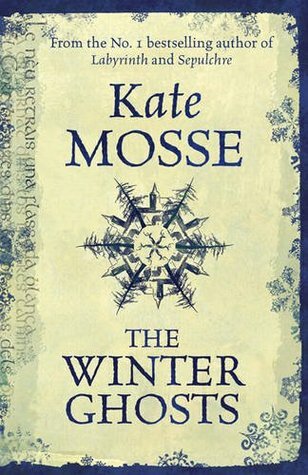 Review: ‘The Winter Ghosts’, to put it quite simply, isn’t at all the type of book that we usually review here on ABookSoFathomless, nor is it a book that I would generally even pick up, but maybe one or two years ago a really lovely friend of mine told me about the book ‘Sepulchre’ by Kate Mosse and how she had loved the book, and therefore I decided that I wanted to read something by Kate Mosse to see whether my friend was right or not. And well...she definitely was. From the first page, this book captivated my attention and drew me into the chilling world of Freddie Watson in the French mountains. To be quite honest, this book features two of my absolute ‘go-to’ things in a novel- set in a time between 1914-1945 and set in France, how could you possibly go wrong with a combination like that? One of the best things for me was how everything was described so wonderfully, it actually felt like I was walking with Freddie through the woods in the snow which was both amazing and haunting. The illustrations just added to this factor- they were honestly amazing and helped further cement the image inside my head. Even more than the setting, Mosse’s prose was amazing. I found that it just flowed off the page beautifully and it fit the story so well as it changed with the different tones and moments within the book. The story itself was amazing too- I’ll admit that it didn’t go in the direction that I was expecting at all, I expected a mystery but what I got was just so much better than just a mystery. I really enjoyed ‘The Winter Ghosts’, especially as a nice little break from the usual YA books that I read so I’d definitely suggest that you all give this book a go if you’re looking for something a little different.